I’ve always been fascinated by Hollywood trailers. So much so, that 10 years ago, I was determined to develop a trailer for my next book at the time, Engage!. Since then, I launched every subsequent book with a trailer. You can see a compilation here. With my latest book X, I broke that tradition. It wasn’t intentional however. I simply got so caught up with the launch and the following book tour that I couldn’t get to it. That didn’t sit well with me and so I decided to do something about it. Over the last several months, I started a few separate book trailer projects. The first two I’d like to share with you are experiments in that they deviate from my usual approach. I wanted to share them with you here to get your feedback on which one I should use as one of the official trailers I’m set to debut. For these two pilots, I partnered with Chief Nina Eric Prospero Torres of NinjaTropic to experiment with alternative takes on what a book trailer could be. In version 1, I emphasize the script and used imagery to visualize the narrative. Since this is a book about designing experiences in a digital economy, I aimed to find the right balance between words, visuals and music to evoke the senses and inspire an action or reaction. Version 2 follows the same script and is visually similar to what you just watched. But with this one, I was distracted by a voice over artist who sounded a lot like Morgan Freeman. I just needed to hear what it sounded like because….Morgan Freeman! While he may not be the best imitator, it was an interesting experience and I’m curious what you think. The challenge here however, is the undulation and pace of a Morgan Freeman-like narrative slows down the experience and adds another minute to the trailer length. Please let me know what you think and I’d appreciate it if you could share this post. p.s. I’d also like to say thank you to NinjaTropic and Eric in particular. Thank you for your patience and openness to experiment! The post Designing the Experience: My Ongoing Experiments with Book Trailers and Storytelling appeared first on Brian Solis. Rome is a dream city for many travellers and artists for centuries. 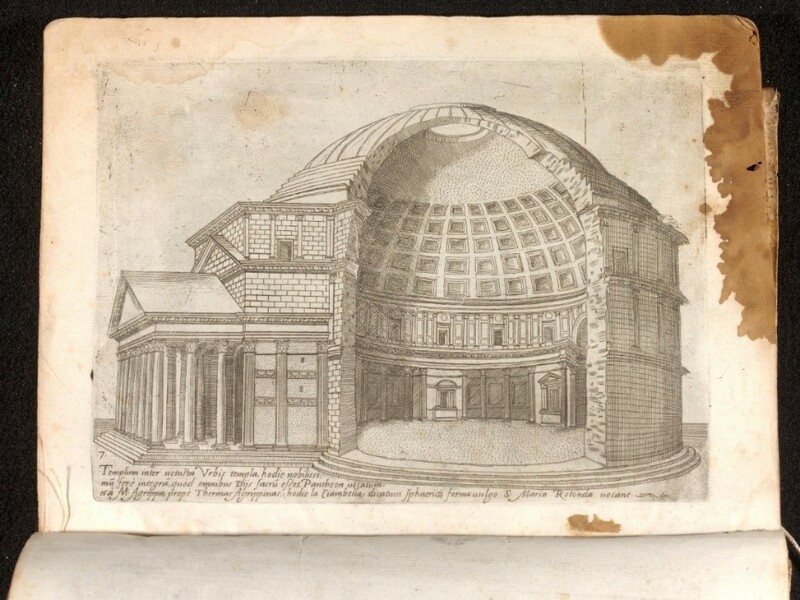 I propose you a journey to the discovery of Rome in 1569 through “Urbis Romae aedificiorum illustrium quae supersunt reliquiae”, “Views of Ancient Rome” by Giovanni Antonio Dosio (1533–1611), an Italian architect and sculptor, and published by Giovanni Battista de Cavalieri (1526–1597), an Italian engraver, in 1569 in Rome [Fig.1]. This book is part of the tradition of sixteenth century guidebooks and “récit de voyage”. 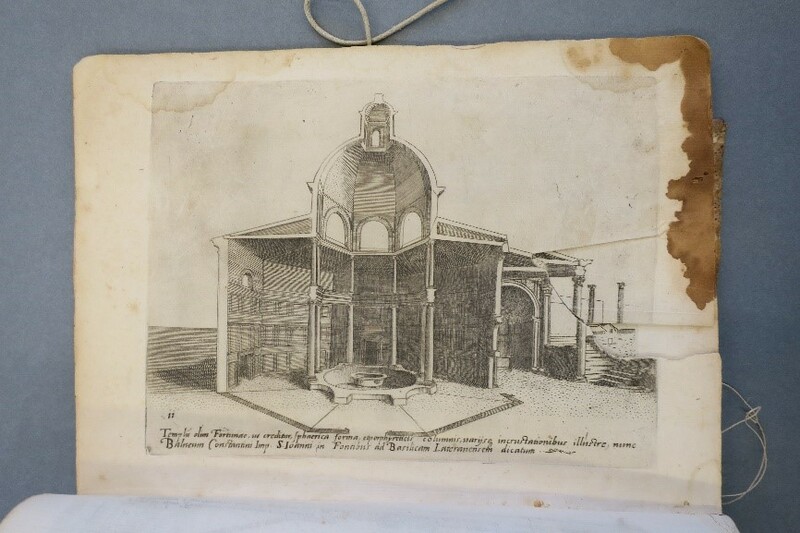 The textblock contains 48 engravings of Roman architecture and ruins printed on laid paper. 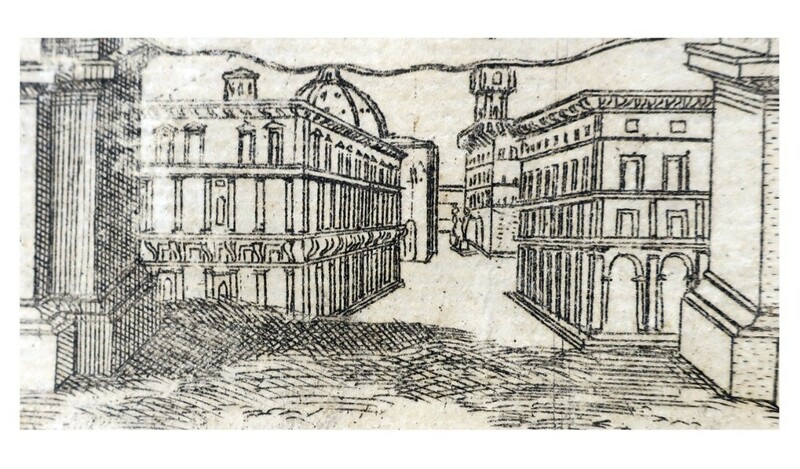 We can see famous old buildings in their context such as Agrippa thermal baths [Fig. 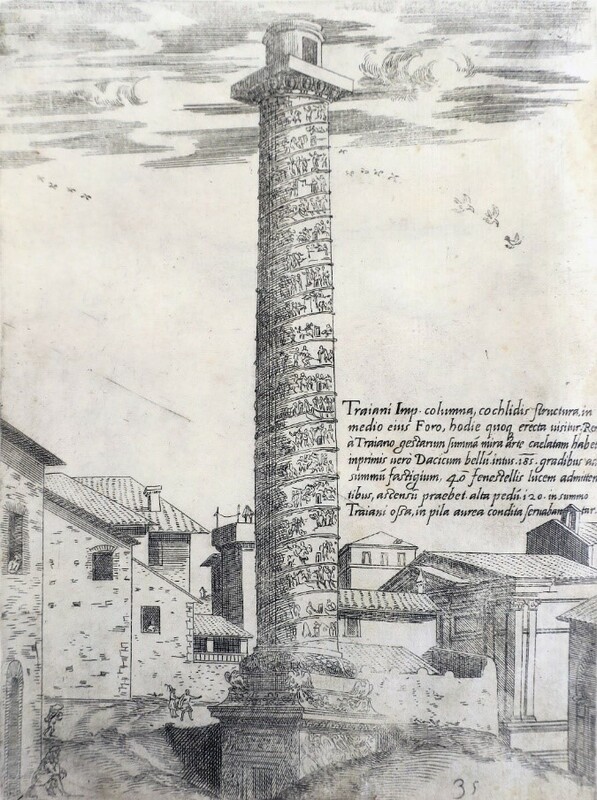 2] or the Trajan column [Fig.3]. 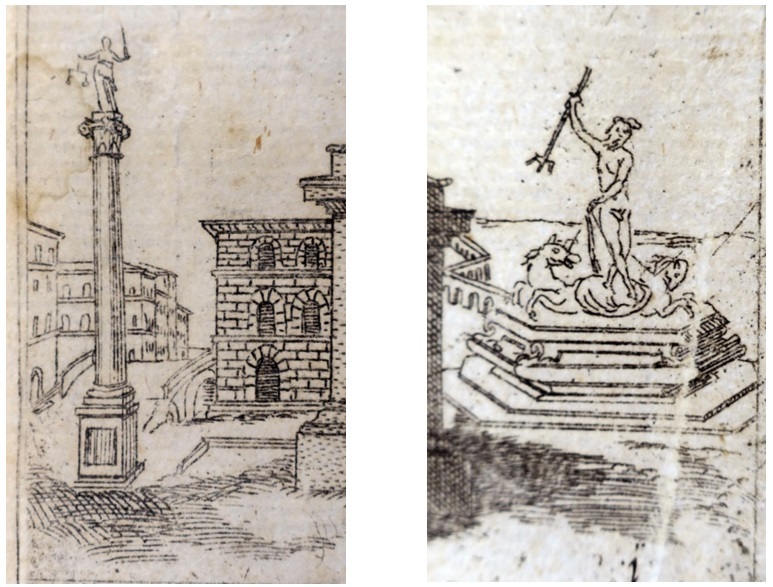 The Dosio’s drawings represent faithfully the state of the monument in the mid-sixteenth century. This degree of veracity is typical of Dosio, and can be explained by the fact that he participated in the excavation of Rome, especially the Forma Urbis in 1562. 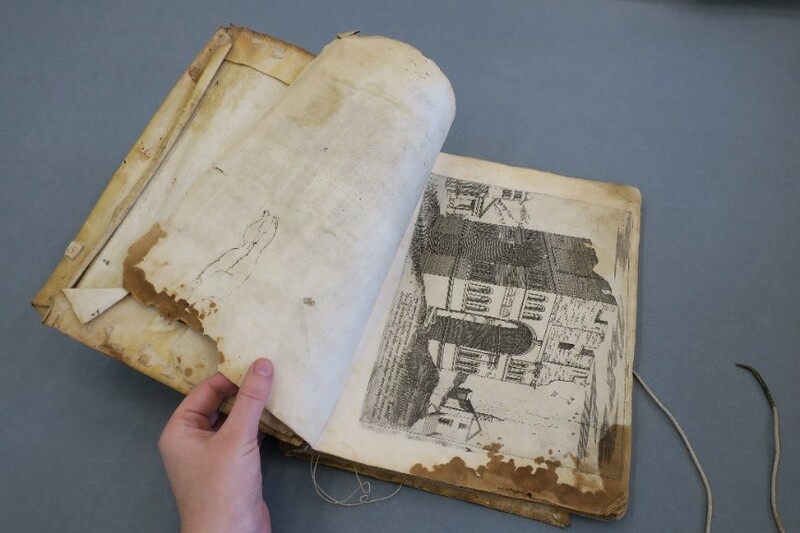 The condition and use of this book is intriguing… Half of the textblock is missing and we are not sure why. 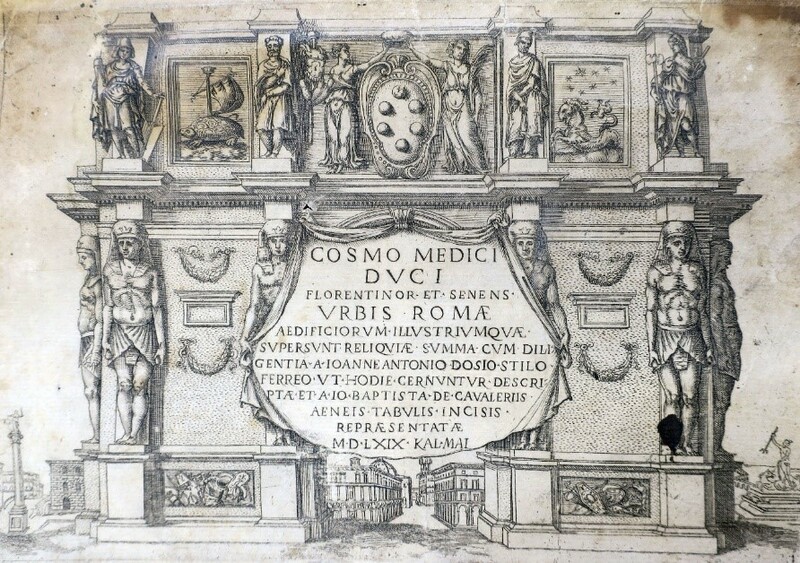 Another edition of “Urbis romae aedificiorum illustrium quae supersunt reliquiae”, in the Complutense Library in Madrid, has in first part a corpus of engravings showing antique sculptures, then our “Views of Ancient Rome”. This corpus could be the missing part of our exemplar. Some folios have ink and graphite sketches of boats [Fig. 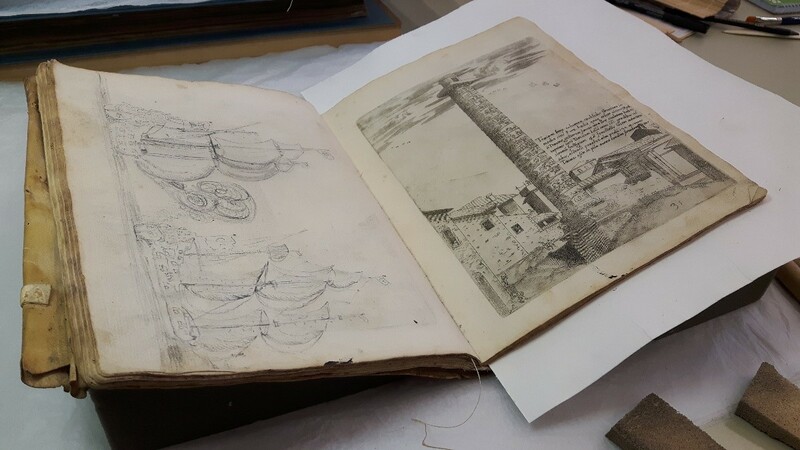 4] and anatomic drawing which made us wonder how this book was used and where it was carried on its on journey? Why was it produced who owned it and how did they use it? The title page shows a triumphal arch with Egyptian figures. 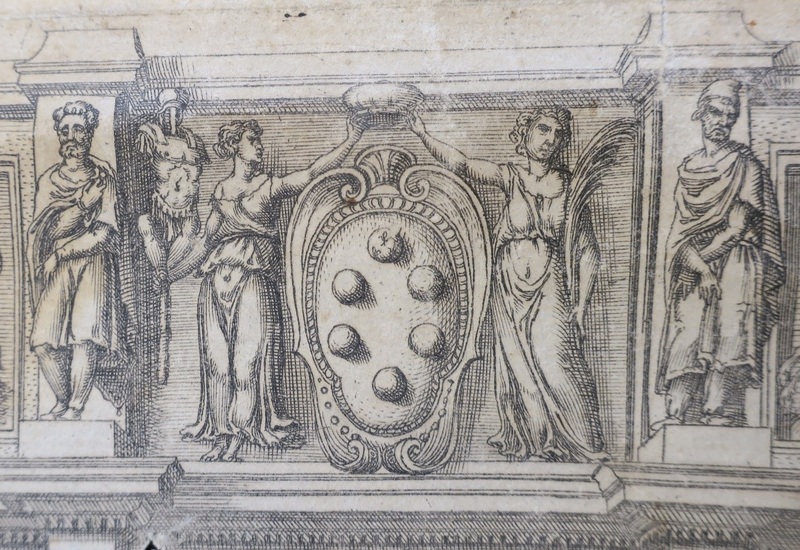 Two of them hold a cloth with a dedication to Cosmo Medici, Duke of Florence and Siena, then we can see the title and the authors’ names [Fig. 5]. On the arch, we can also see different coats of arms surrounded by figures. At the top centre, the shield with six semicircles held by two women is the Medici coat of arms [Fig. 6]. 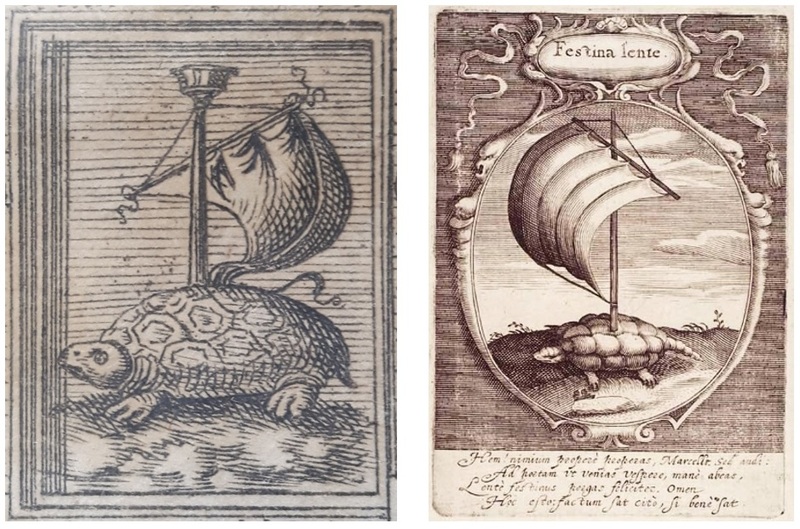 Cosmo I de’ Medici (1519 – 1574) took festina lente (in English “more haste, less speed”) as his motto and illustrated it with a sail-backed tortoise. At the top left, we can see this emblem [Fig. 7]. Figure 8 (Right hand) : Sail-backed tortoise in Peter Isselburg, Emblemata politica, Hans Walch, Nuremberg, 1617. 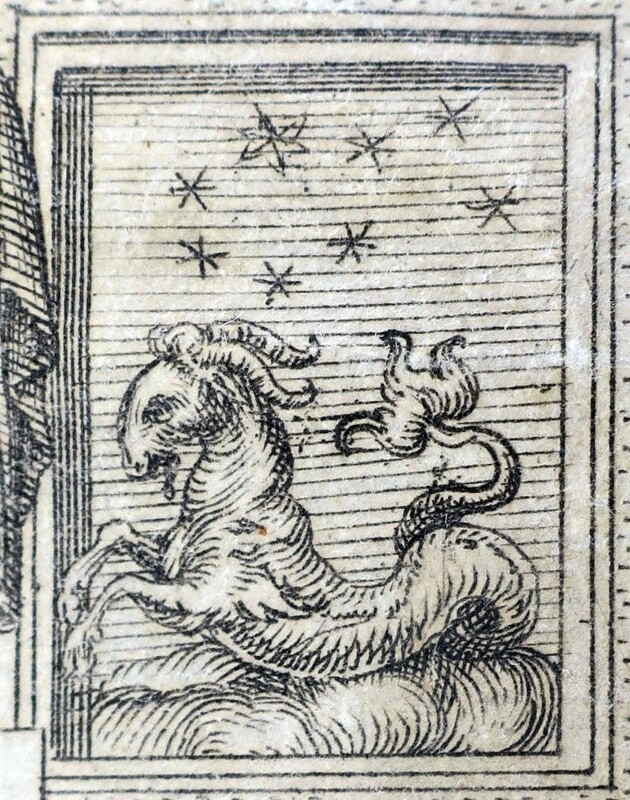 At the top right, a chimera with a goat bust, a snake body and a lion tail [Fig. 9]. At the bottom, we can see different monuments like at the left-hand, a column with a Justice statue [Fig. 11], a perspective street at the centre [Fig. 10], and at the right-hand a statue with Neptune flooring two sea horses [Fig. 12]. Views of ancient Rome is an in-6 (280 x 225 x 35 mm) and each section have 6 leaves. The binding structure is a limp parchment binding. Limp binding is a bookbinding method in which the book has a flexible cover. Parchment has used in this case. The cover is made with one single piece of parchment, folded around the textblock. 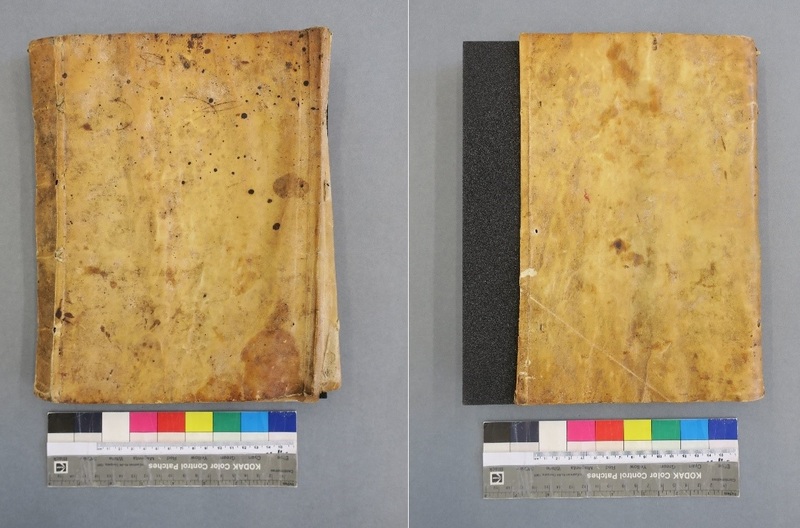 Sometimes some limp parchment binding, like this one, have flaps and alum-tanned leather thongs. The sewing support are in the same material than the tongs. The sections are sawn on four split thongs, this thongs are then laced into the parchment cover at the joint. After the sewing, a strip in paper is fixed on the spine and the joint area of the board. The spine reinforcement materials are used to strengthen the spine and to assure the text block is well attached to the covers. Usually, this piece of paper is a re-used part of another textblock. 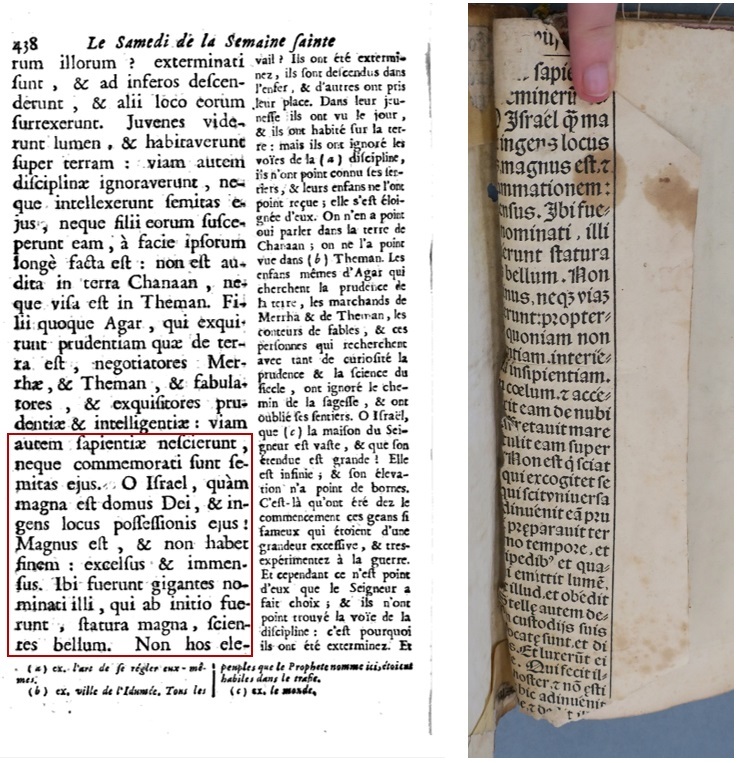 And it’s the case for View of ancient Rome, a vellum paper strip with a printed text in Latin in two columns is visible on the spine and the inner covers [Fig. 14]. We can recognize gothic typography and the text has been translated as (Baruch 3:9-15) a passage of the Bible about Israel people. [Fig. 13]. The endleaf on the inside back cover presents an ink sketch of a vase and a kind of cylinder box with a ring on the top and we are currently searching for similar examples. When this book arrived in the conservation studio, it had a notable amount of surface dirt and a yellow patina on the binding. There were stains and abrasions on the parchment covers and it has many deformations most likely caused by extreme changes in humidity. The hygroscopic nature of parchment makes it dimensionally unstable, causing it to expand and contract in response to changes in its environment resulting in distortion or cockling. This behaviour is due on one hand to its method of manufacture and on the other hand to the conditions in has and is stored in. For instance during its manufacture, parchment is stretched on a frame for thinning and drying. This operation give a particular direction at the structure of the skin and constrains it. The textblock was dusty and has prominent brown stains throughout in the tail area. The brown ink of some sketches [Fig. 15] could have been accidentally spilled making these brown stains [Fig. 16]. All of the leaves had tears and losses. There is only one extant endband. 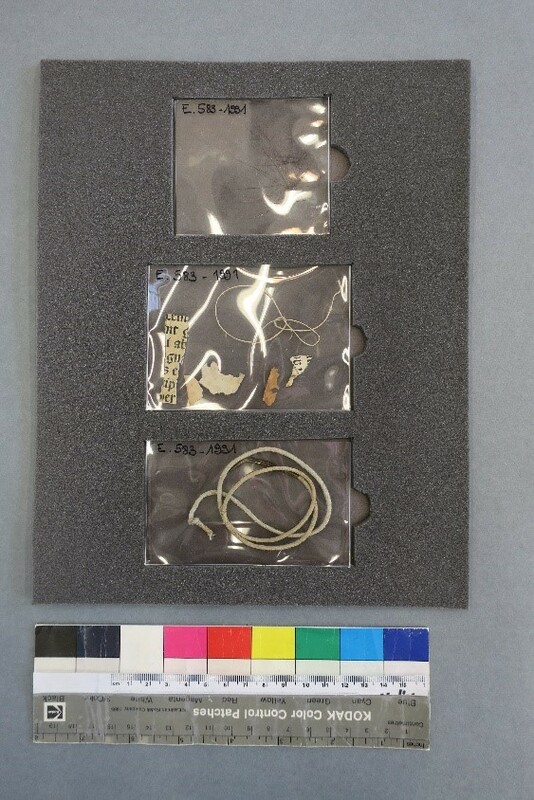 After discussion with Olivia Horsfall Turner, senior curator in Art and Digital department, Jane Rutherston, head book conservator and I, an archaeological approach for treatment was chosen. . 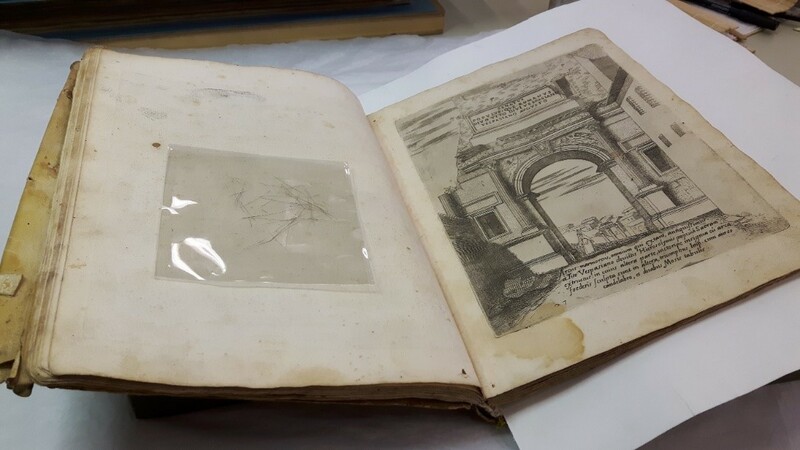 The purpose was the stabilization of the book in order to enable consultation and preserve this important record. This approach involved minimal intervention and a strict respect of the historical structure to ensure access for researchers to the structural elements normally adhered or hidden. First, the cover and the textblock have been cleaned with a chemical sponge (Smoke sponge®) and a smooth brush. During this cleaning, several unidentified hairs were found in between pages which we have kept and are hoping to have identified [Fig.17]. The tears and losses were repaired with wheat starch paste and Japanese tissue but we chose not to fill the losses as the paper was strong enough to not tear during a consultation [Fig.18]. Spine reinforcement of the passage of the Bible was left as is to enable at the researchers to see the codicological aspects. The endleaves have been reattached with an unbleached linen thread and the headband in tail has been consolidated with Japanese paper. In order to support the bindings and preserve the headband, a wedge in Plastazote® was inserted so the binding keeps its original shape [Fig.19] [Fig.20]. In accordance with this minimal intervention approach, it was decided to not reduce the cockling of the parchment. In this case, treating the cover would be an aesthetic treatment. This kind of treatment is being re-considered in the conservation world because of the impact moisture can have on the skin. Finally, Views of Ancient Rome is now housed in a bespoke museum quality phase box to protect it from dust, light and mechanical damage when it is stored. Phase boxes also limit variation of temperature and relative humidity. 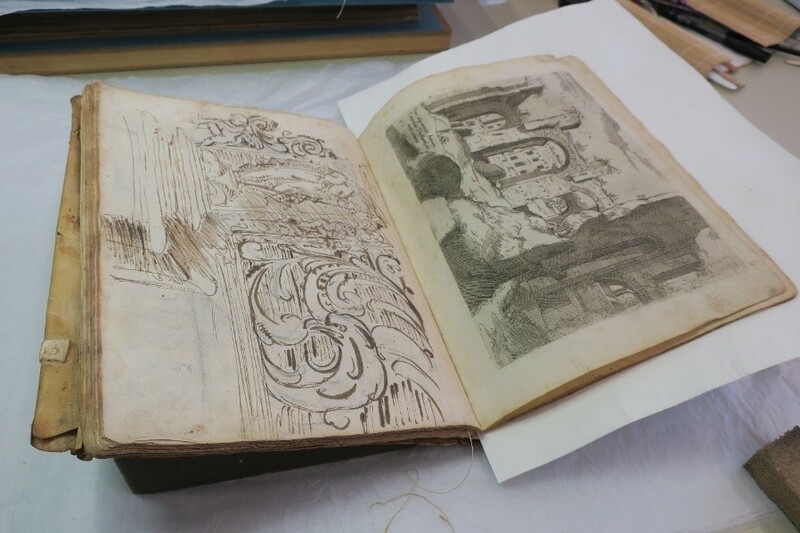 The patina documents the book’s life and its journey over 440 years! For instance it indicates it has been heavily used and kept in an environment with fluctuating temperature and humidity. 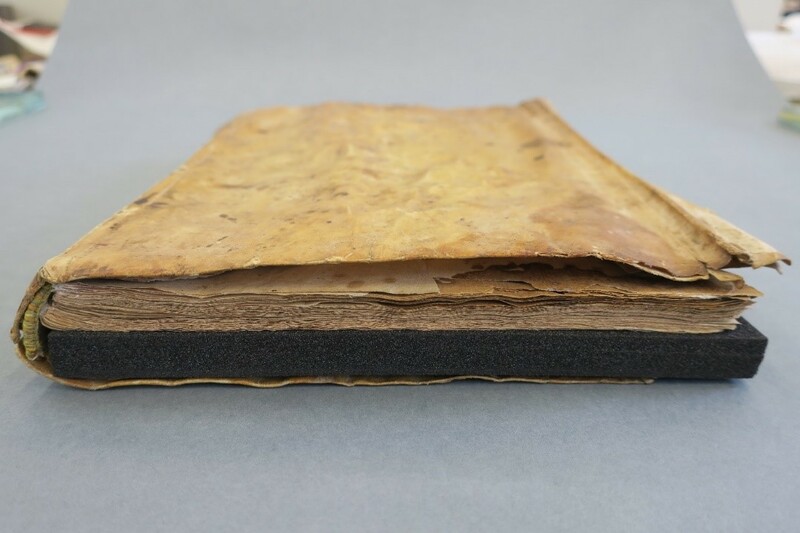 All of this before its acquisition by the Museum, in 1991: The bookseller’s catalogue Ornements, architecture published by La Sirène in Paris in 1990 describe our exemplar as damaged with several stains and a detached parchment binding. And some questions about this past remain unresolved: What happened to the missing pages? Were they deliberately removed and sold separately? Why an amateur artist thought it appropriate to sketch boats and figures inside of it? Where did the brown stains come from? After this long life and 26 years of waiting in the Museum stores, Views of Ancient Rome can be started a new formidable journey as museum object. I would like to extend my sincerest thanks to Anne Bancroft who contributed and reread with patience this blog’s article. McGowan, Margaret M., The Vision of Rome in Late Renaissance France, London, Yale University Press, 2001. Luporini, Eugenio, Un libro di disegni di Giovanni Antonio Dosio, Firenze, Valecchi, 1957. Valone, Carolyn, Giovanni Antonio Dosio and his patrons, Thesis (Ph. D.), Northwestern University, 1972. Here at Sprout Social, reading really is fundamental. Good books teach us about our craft, inspire us to be better leaders and even allow us to fall into escapist fantasies during our cold winter commutes. As 2016 draws to a close we asked members of Team Sprout to share the best things they’ve read this year. Here are some of their top picks in engineering as well as a few fiction and nonfiction options to mix things up. If you’re looking for a good travel read this holiday season, these are all fantastic choices. “The C Programming Language” is one of the few programming books that not only offers valuable and practical information but is enjoyable to read. While it focuses on the C language, it outlines useful concepts and design patterns for any programmer looking to build well-architected, efficient programs. This book does assume some familiarity with basic programming concepts but even novice programmers should be able to pick up and follow along. About the Authors: Brian Kernighan is a computer science Professor at Princeton University. He has contributed to the development of Unix and coauthored the AWK and AMPL programming languages. Dennis M. Ritchie was the computer scientist responsible for creating the C programming language and was also a key contributor to Unix. Guess you could say he wrote the book on C.
About the Author: Marijn Haverbeke is a software developer and blogger based out of Berlin. “The Idea Factory” isn’t, strictly speaking, a programming book, but it’s a fascinating read about the history of innovation through the 20th century. “The Idea Factory” explores how engineering and technical innovation revolutionized communication and ushered in the Information Age. Countless aspects of modern life have been invisibly influenced by the innovations at Bell Labs, and this fascinating history sheds some light on how much the world has changed as a result. About the Author: Jon Gertner is an editor and technology writer at Fast Company magazine. Previously, he worked as a science, business, and economics writer at New York Times Magazine. “The Idea Factory” is his first book. “Extreme Programming Explained” is a thorough but quick introduction to the XP management philosophy and walkthrough of how to involve the whole team to get buy in on said philosophy. Testing, agile business practices and TDD are buzzwords that get thrown around a lot in development circles, but “EPE” breathes new life into those concepts and reminds us why we need to be intentional about our processes and team dynamics. The examples are direct, simple, and easy to apply to day-to-day work. Even if you don’t subscribe to all of the tenets of XP, reading “EPE” is a worthwhile exercise in checking your processes as a team. About the Author: Kent Beck is a software engineer, the creator of the extreme programming methodology, and one of the original signatories of the Agile Manifesto. “Station Eleven” is the most inspiring and heartbreaking story about the aftermath of the apocalypse you’ll read this year. It won the Arthur C. Clark Award for Best Novel in 2015 and was the champion of the 2015 Tournament of Books. “The Hollows” follows Rachel Morgan, a heroine with an absurd knack for finding herself in trouble. It’s an Urban Fantasy series with tons of detective work, romantic entanglements, character development and soul-searching. And vampires. Because who doesn’t love a good vampire series? “Americanah” is a stunning piece of contemporary literary fiction. It spans three continents as it examines the most complex themes of life in today’s globalized world, from love and relationships to race and identity. And it’s not just us who were moved by this powerful exploration of life and love: Americanah won the Chicago Tribune Heartland Prize for Fiction and the National Book Critics Circle Award for Fiction. It was also nominated or shortlisted for the International IMPAC Dublin Literary Award, the Women’s Prize for Fiction, the Andrew Carnegie Medal for Fiction and the Goodreads Choice Award. A copy of “Extreme Ownership” has been steadily making its way around the engineering and product teams here at Sprout. Contrary to what the title might imply, this is not a book about the military—it’s a leadership handbook grounded in the lived experiences of Navy SEALs. “Extreme Ownership” has a lot of inspiration to offer about mission, team collaboration, and communication. Willink takes these lessons from the military and makes them applicable in everyday professional and personal settings. Nate Silver has been a strong voice in predictions and betting markets for political races and sports for nearly a decade. “The Signal and the Noise” pulls back the veil and lets us see into the process that Silver uses to distinguish truths in a sea of noise. These insights are fascinating and essential reading for anyone interested in the processes involved in Data Science. ‘99% Invisible’ is a show about the unseen thoughts, decisions and labor that shape the way we live our lives. Each episode takes a deep dive into a topic that invisibly influences the world. They’ve done collaborations with other audio productions like Planet Money and DecodeDC, and are one of the most popular podcasts available on iTunes. It’s a show that’s all about…the internet! PJ Vogt and Alex Goldman take deep dives into everything from memes and internet arcana, to why Google Adwords support techs hate dealing with locksmiths. If you spend time online and don’t quite understand why the Internet is so weird, ‘Reply All’ will help you figure it out. This post 10 Book Recommendations From Team Sprout originally appeared on Sprout Social. Did Penguin Just Design the Worst Book Cover of All Time on Purpose? The 50th anniversary publication of Roald Dahl's children's classic Charlie and the Chocolate Factory is leaving a bad taste in some mouths. Controversy surrounds the cover of the Penguin Modern Classics edition, which eschews Willy Wonka's fanciful factory, golden tickets, Oompa-Loompas and other familiar story elements. Instead, we get a stylized image of a young girl, quaffed to the hilt in colorful bows and silks, sitting in her mother's lap. The picture is a cropped version of a photo used in a 2008 fashion magazine feature (see below) completely unrelated to Dahl and the book in question. According to the publisher, the cover "looks at the children at the center of the story, and highlights the way Roald Dahl's writing manages to embrace both the light and the dark aspects of life." Among the public, bitter reactions outweigh the sweet, with most reasoned negative opinions running along the lines of this comment in Creative Review: "It seems a bit misleading, doesn't it? If I knew nothing about the book, this cover would suggest to me that it's a really disturbing story for adults, probably a thriller about young girls in the beauty industry." The most deliciously snarky critique comes from the Guardian, which calls it the worst cover of all time, grousing that the image "reimagines Dahl's classic as 1960s Wyndhamesque horror, robotic alien children stranded in a stark asylum." Here's the original photo, published in Numéro magazine in 2008. Image via.